Facilities can use this reference tool daily to manage the constant changes to Medicare billing and reimbursement process. 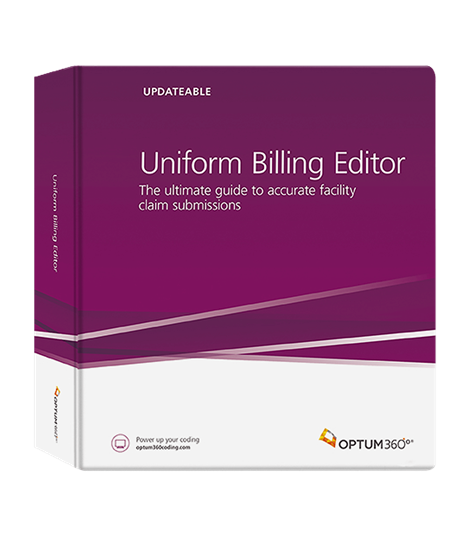 The Uniform Billing Editor provides detailed, accurate, and timely information about Medicare and UB-04 billing rules and assists the user with 5010 data, UB-04 and 837i requirements. Quickly locate topics based on field locators, revenue codes, or coding structures. This easy-to-use format is fully indexed and tabbed with icons for quick reference. Quickly link HCPCS and CPT® codes to applicable revenue codes. This crosswalk helps you to prevent the most common reasons for rejections—mismatched revenue codes and CPT® or HCPCS Level II codes. • Crosswalk to 837 institutional claims. Provides links to 837i 5010 data elements and any applicable billing rules—facilitating easier transition to the 837i. Coding and billing tips with quick access to official sources. Submit claims to Medicare accurately the first time—to help you reduce claim delays and denials.